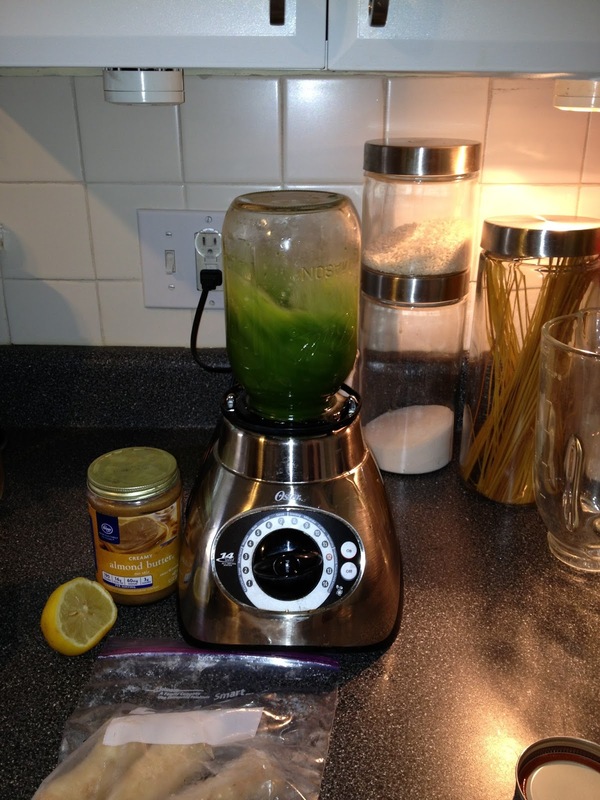 This is my series about my experience with the Dr. Oz Three Day Detox Cleanse. Check here for my post on why I decided to attempt the the cleanse and how I prepped the ingredients beforehand. 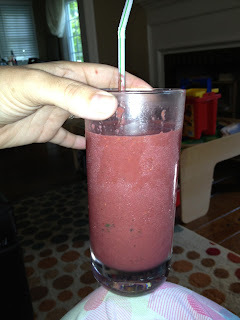 I have a lot to say about each smoothie so I figured I would go through one each day and then discuss how I felt during each day of the detox. Having done this cleanse once before I was looking forward to the breakfast smoothie. It’s by far the best of the day, probably because it has the least amount of veggies. This one also blends up the easiest. As much as I would love to have some uber expensive blender that turns ski’s into dust, I just can’t justify the expense. (PS My birthday is in December). So instead make due with my mediocre Oster blender. I’m a regular green smoothie drinker, so I’ve learned a few tips to help turn fiberous fruits and veggies into a smooth beverage. First, blend the leafy greens (in this case spinach) and the liquid (in this case, water) together until the greens are liquefied. Once that is done, add the rest of the ingredients. If your recipe requires a ton of solids (like the lunch smoothie) add the fibrous ones first, blend, then add the rest. This is where me blending spinach and water. I once read you can fit a mason jar on your blender so you can make the smoothie in the jar, then drink it right out of the jar, thus saving dishes. It doesn't work. Immediately after snapping this picture, green liquid started rapidly flowing out of my blender! 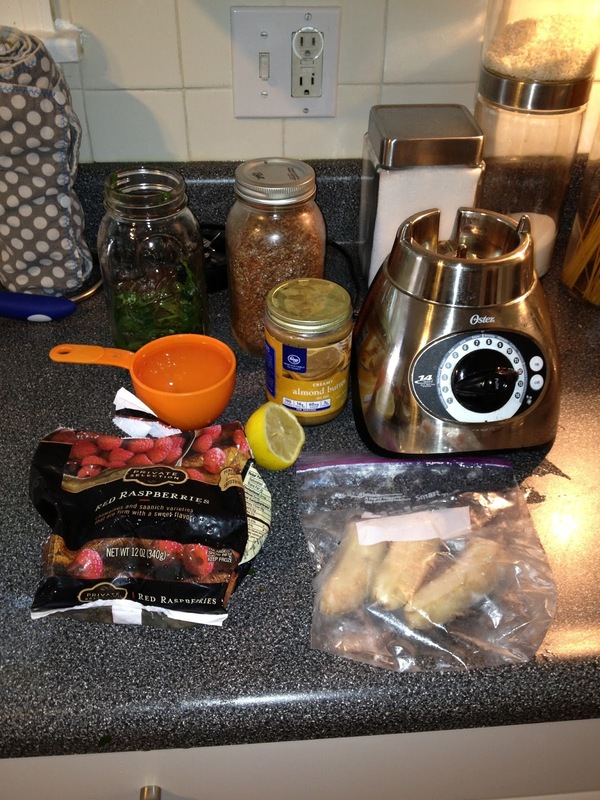 For this smoothie I was able to add the raspberries, banana, lemon, flax and almond butter all together and it blended into a pretty pink concoction. I’m generally anti-banana but I found when I use frozen bananas, the banana-ness is tamped down to level that doesn’t make me gag. Plus, frozen bananas provide a smooth texture. If think you’ll have a texture issue when trying to drink the smoothie, try using a straw and adding some ice to the drink to make it super cold. I cheated before I even got to the first smoothie of the day. Fail. I’ve been trying to cut down on my coffee consumption so the green tea switch wasn’t hard. Don’t get me wrong, I love coffee and I won’t be cutting it out of my diet any time soon but I’ve cut down from 3 to 1 cups a day, so it wasn’t hard to cut it out completely, temporarily. If you told me I couldn’t have it ever again however, I might freak out. Anyway, the only problem with green tea is that I cannot, under any circumstances drink it on an empty stomach. If I do, I’ll be vomiting within 10 minutes. Well, guess who forgot that rule? I was planning to make my smoothie after I dropped Max off at school, so when the stomach pains hit I didn’t have time to throw one together. I grabbed a few chunks of cantaloupe as I went out the door and prayed I didn’t barf on the new teacher. That would have been a terrible way to start his first year of school. The breakfast smoothie was sufficient sustenance until I had a late lunch at 2pm. Despite the lunch smoothie being HUGE, by 5pm I was starving. Late afternoon has always been a trigger time for me. It’s when I have my worst eating habits. So not only was I legit hungry but the little devil over my shoulder was telling me “This is the time we stuff our face. You know there is fudge and jerky in the fridge, right”. I managed to ward it off til 5:30 when I cut Max a slice of fudge and gave myself a tiiiiiinnnnnnyyyy piece. At that point, I figured I might as well have an early dinner and made the dinner smoothie. Later, we took Max to get ice cream to celebrate the first day of school and I just looked on while Brett and Max consumed my favorite dessert. I didn’t even have a taste when offered. Go me! In order to avoid further temptation while Brett and Max ate dinner I took my detox bath while they dined on the most delicious looking salad I’ve ever seen in my life. The bath is amazing, though when I got out I was woozy and had a terrible headache. Apparently, the detox headache is a common thing. After an hour I felt even worse and couldn’t stomach drinking another smoothie as a snack. I caved and had a small mixed green salad with balsamic vinegar and one pepperoncini. I feel a little crappy about cheating, despite it being a healthy one. I feel like I can’t follow through on anything. However, one slip up isn’t the end of the world. It’s not a reason to stop the entire process. So I’ll try again tomorrow and I’ll do my best. I can’t say I’ve noticed any major difference in how I feel or look. Maybe once the headache goes away I’ll start to notice something. If you have any questions about this cleanse, please feel free to ask them in the comments. I’ll be happy to answer them based on my experience.